Siltbreaker shows the potential of lore-centric updates. While this year’s International Battle Pass comes with the usual goodies, Dota 2 players are being treated to a PvE minigame called Siltbreaker. The multiplayer experience will come in two parts: The Sands of Fate is out now and, later in the summer, A Vault in the Deep will finish the tale. As much as fans are excited about the mode and the new cosmetic items that come with it, more players are left waiting for Valve’s next contribution to an underrepresented facet of Dota 2: its lore and universe. 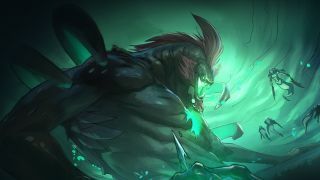 Players have been wondering for years about the connections between fishy characters such as Slardar, Slark, and Naga Siren, and even the distantly-related Sven. Meanwhile, other theorists speculate about the fourth elemental spirit. The history of the game contributes to Dota 2’s approach to story, events, and updates. A major issue going into the game’s release was that Valve, despite working with Icefrog, didn’t have the rights to all of the intellectual property that came with DotA—a mod for a Blizzard game. After all, the two publishers had come out of a fight over the rights to 'Dota', with Valve winning in the end. The developer couldn’t take it for granted, however, and this dynamic has been influential in the history of Dota 2's storytelling. While the relations of many heroes remain intact, the story has been rebuilt from the ground up. The community did try to carry over a number of the references from Warcraft 3 in the remake. Players still commonly use “Furion” for Nature’s Prophet, which was adapted from the WC3 name “Malfurion,” and the hero selection screen allows players to type this in to search for the hero. However, for the most part, the remake’s developers were left needing to tiptoe around the old iteration’s ghosts, which paved the way for Dota 2 events and lore as we know them today. The next day, Valve announced an event called 'Wraith Night' to introduce Wraith King, a full revamp of the old Skeleton King. Players harvested energy from defeated enemies in order to revive the king's skeletal body, bringing him back for good as a lich-like entity. The event itself has been engraved in the game’s memes, as “removed for pressing ceremonial reasons” is often dropped when fans joke about a hero disappearing from the game for any reason. Wraith-Night became a precursor to how Valve handled lore-related items and events, such as the Phantom Assassin “Nemesis Assassin” event about a year later. Stories and lore, then, also became ways for Valve to distinguish its product from other iterations and copycats. Most recently, even the story of Monkey King, a traditional story and video game character, feels like a world of its own, establishing his presence as a near-omniscient figure. He speaks vaguely of other heroes’ relations, and the comic hints at the presence of a fourth spirit, much like the other elemental heroes in the game (Storm, Earth, and Ember). Meanwhile, given the relatively small size of the Dota 2 development team, there’s also the question of how much manpower is actually going into lore-related updates. It’s assumed that developers are keeping at least one eye on it in order to keep at least some mild consistency among official releases. But Valve is a team that works at minimum power for maximum output, and so while they may love to release lore, it often takes a backseat to game-focused updates. For that reason, the issues for community lie not in what Valve releases, but what they don’t, which is quite a bit. Valve seems aware of this and makes the best of what they can release. Story trickles out slowly and subtly, leaving bits and pieces for players to put together. For instance, the game will trigger certain voice lines when certain heroes lane together, providing a breath of fresh air in a tense laning stage and a look into their histories. Characters such as Lina and Crystal Maiden affirm their relationships or familial ties, and Monkey King teases his deep knowledge of the dark secrets of many heroes. (Keeper of the Light affirms his thirst for most women.) Also, in-game items by fan creators that make it past the Workshop stage often have their descriptions updated to hint at hidden lore. Players have done extraordinary work throughout the game’s lifespan attempting to pull together the light trails of storylines. A sparsely-updated lore megathread on the developer feedback site has accumulated 1530 posts, and posts on Reddit will occasionally spring up. SirActionSlacks recently began a series called Loregasm in which he attempts to piece together the lore, mixing in his own elaborate theories to try to make sense of what fans have been given. The reliance on open-ended community work is a break from games such as League of Legends and Overwatch, each with sprawling and elaborate stories that prompt creative fandoms. Dota 2’s gameplay is infamously complex, though, and while there are absolutely enthusiasts of the story, the game itself remains the central focus to most fans. Events like Siltbreaker have the potential to combine all aspects of Valve’s approach to in-game storytelling. With the introduction of Siltbreaker himself, who may appear in Part II, plus a gorgeous introductory comic and the integration of heroes’ hidden background, fans already have some trails to follow. Now it’s matter of how Part II, and further lore, will keep expanding on this groundwork.